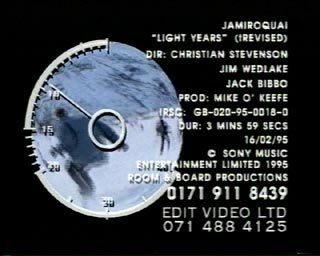 Light Years was never officially released as a single although a number of releases did appear in shops around the world. With the main (revised edit) video being 3 minutes 59 seconds in length, there is an additional 54 seconds of "credits" at the end. The video was filmed in St. Anton in Austria. The 4 To Da Floor Mix Edit version of the video is 3 minutes 30 seconds in length.